The Men’s Gathering grows every year because of you! Last year, by sharing your experiences and telling your friends about the event, we had over 85 men gathered in 2018. We are hoping to break the century mark this year! Please feel free to download the information we will soon have avaiable on this page to post in your home church or share with your friends. An 11×17 poster can be printed to publicize the event or you can download a power point slide to add into your announcements. We also have a note you can copy to ask your Church to include in the bulletin and invite cards you can hand out to other men. Thank you for spreading the news! Here is a snippet you can copy and paste into your own publications. 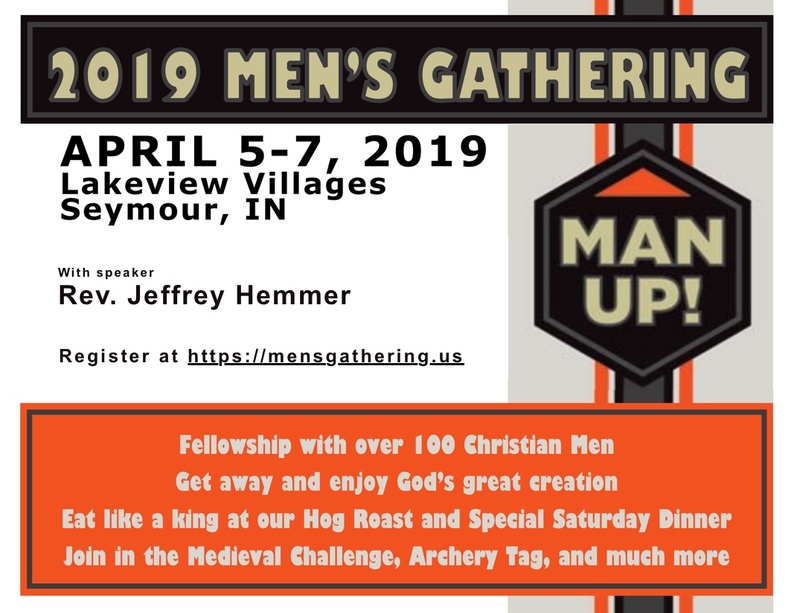 Join other men in Christian fellowship on April 5-7 at Lakeview Villages in Seymour, IN as we explore the topic of “Man Up!” with Pr. Jeffrey Hemmer. Get away and enjoy God’s great creation, eat like a king at our hog roast and join in the Medieval Challenge, Archery Tag, and much more. Visit www.mensgathering.us for info and registration.